Tagged Adobe, ergonomics, Premiere Pro, productivity. Bookmark the permalink. Pretty frustrating, I agree! A method I’ve found is setting an unused key (in my case it’s “D”) to “Select Nearest Edit Point as Roll”, which selects the edit point your playhead is over, and then applying the default transition. This helps keep it focused on where the playhead is, so the only extra step now is pressing D to select. It also additive so you could select multiple edit points to apply the transition to, though this could be frustrating if you have a bunch of stuff selected. In that case, I use “E” to Deselect All. Very nice suggestion as well! 2. Provide NEW shortcuts for users who want to apply default transitions to selected clips rather than to clips under the CTI. This way, users would have the power of CHOICE. They could set their shortcuts to work like they did in CS6, period. Or they could choose a balance of CS6 and CC functionality, with different shortcuts for each function. Adding default transitions is something users do so often that we need the choice to decide how it works. I’ve been on the holidays, unable to respond. The second solution was what I proposed to Adobe, especially since you already have the “Apply Default Transition to Selection” shortcut key, but I don’t see it coming back. I also suggested limiting the functionality to selected trimming points, not to selected clips, which would be more intuitive. Not sure on the status of it either though. this is also very usefull before adding Marker to sequence. 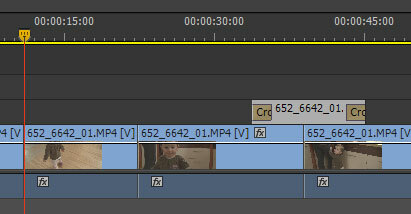 if a clip selected, then the “add marker” key makes a marker to the selected clip and not to trhe sequence. so as from now the add mark combination will be “D”, “M”. This is a great post, thanks for your time writing it. Sometimes I think Adobe premiere engineers listen to the Nike motto a little too much and Just Do It, never thinking it through. The most frustrating thing is when you slip a video track causing one clip to be selected, then try to add a transition by the Current Time indicator (CTI) and nothing at all happens. It just does nothing. From a programming standpoint the feature should work “smartly” based on what was done last. If you select a clip(s) last then use the new CC method to add transitions or whatever. If you scrub or click the CTI or time bar as the last thing before ctrl + D, etc. then the software should use the CTI. It’s not extremely difficult to code that smart functionality into an advanced software package. An interesting idea. Though it also requires you to know about this behavior, and it might be confusing. I’m thinking rather about not adding the transition when the selection is out of visible range. Which version of Premiere are you using?